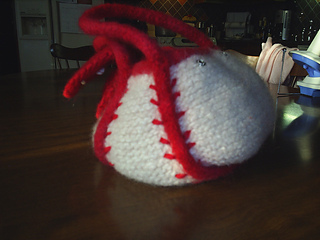 Home Run: 7" x 5" x 3" Grand Slam: 10" x 7" x 4"
Inspired by America’s favorite pastime, the lines of this bag resemble the seams of a baseball. The flap can be opened from either side of the bag. Pattern is written for two sizes, the smaller Home Run, and the larger Grand Slam. All assembly is done on the needles and bag is seamed with applied I-cord. 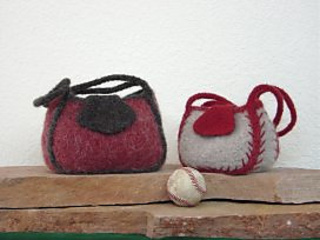 Decorative stitches can be added after felting to simulate the stitching on a baseball.